Hello again. Well, tomorrow is the day when Sheena will be bringing you her fantastic new stamps....A Little Bit Magic. I cannot wait to see all of the other Inkoids samples on the telly. Luckily, I am on holiday from work this week, so I will be glued to the telly at 9am and 4pm. Today's sneak peak is a bit different for me. This is a glass frame that's found in a supermarket and I heard it shouting out "BUY ME", so obviously I had too. 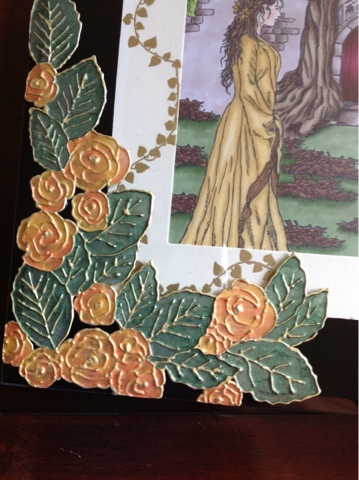 The outside 2 corners are stamped with white Stayzon, and then using pebeo outline and paints, I have coloured the leaves and roses in. 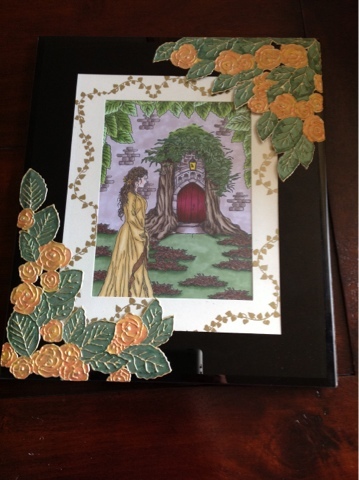 The cream frame is stamped and then embossed with gold WOW powder. The picture is created by doing alot of the masking technique. 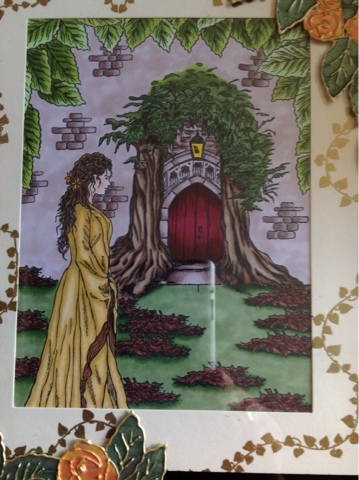 I started off by stamping and masking the leaves at the top of the picture, then stamped Honesty, then made a mask for her, stamped the doorway after I had masked her off, then stamped the smaller bricks and then stamped the piles of leaves on the floor. PHEW!!!!!. I then began the process of colouring the picture, using my Copic pens (yes I do love my Copics). Anyway, you will hopefully be able to see this better tomorrow on the telly with all the other samples myself and all the other fab Inkoids have made. Ohhh, and not forgetting the lady herself...Sheena. This is stunning Caroline. I love the scene you have created.